An artist's recreation of the Christiana incident from Still Under Ground Railroad Records, 1886. On September 11, 1851, wealthy and well-respected Maryland farmer Edward Gorsuch, a small armed posse of his supporters, and a deputy federal marshal arrived in Christiana, a small town in Lancaster County near the Chester County border. Gorsuch and company were acting on intelligence that three of his slaves who had escaped two years ago were hiding out near Christiana, and the Fugitive Slave Act of 1850 gave them pretty broad authority to kidnap blacks they claimed were fugitive slaves. They proceeded to the farm of William Parker, a mulatto man who had been leading efforts of free blacks in the area to defend themselves from kidnappers and white thugs and who was harboring the fugitive slaves Gorsuch sought. Alerted to Gorsuch's plans, perhaps in advance or perhaps as they unfolded, blacks converged on Parker's farmer to prevent Gorsuch from carrying out those plans. The confrontation ended violently, with Gorsuch killed and others in his party wounded. The nation was shocked. Southerners and seemingly most Northerners were outraged at that a prominent citizen like Gorsuch could be killed, and demanded their killers be brought to justice. Parker and the other blacks fled, and county and federal authorities responded rather severely, arresting several white men for their alleged involvement in the incident. Those men were tried and found not-guilty in a well-publicized trial later that year. Looking at the immediate reaction in Lancaster, both Democrats and Whig newspapers condemned the killing, but their response is interesting for how far they missed their mark on who was responsible. They identified white abolitionists as the culprits, presumably because their worldview prevented them from giving any agency--any credit--to blacks. Plus, the more they talked about blacks' roles, the more they would actually have to think about the horror of being taken from freedom to slavery. It's also worth thinking about the Christiana Riot from the perspective of the generation that would enlist in the Union army ten years later, especially because Company C, 79th Pennsylvania, was largely recruited in Sadsbury Township, where the incident took place. 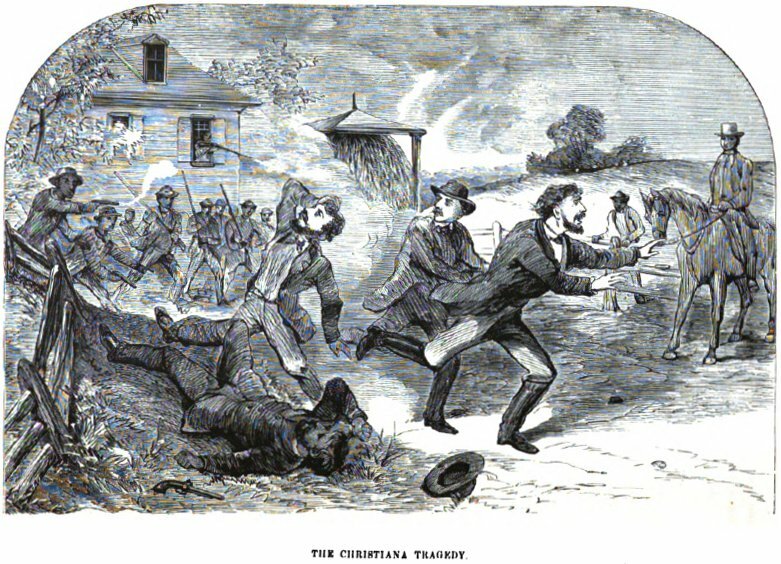 Looking back, many scholars see the Christiana Riot as a key event in the sequence of events that put the nation on a collision course with civil war, as it suggested the compromise the produced the Fugitive Slave Act was untenable. It's hard to tell how the incident affected the feelings and opinions of boys who would become soldiers ten years later--whether it produced sympathy or antipathy towards Southern slaveholders--but either way it became much easier to envision a future of violence. Here are some primary and secondary sources related to the Christiana Riot, listed from oldest to newest. Both the incident and the trial were dramatic events and make for interesting history. William Parker, "The Freedman's Story: In Two Parts." The Atlantic Monthly, vol. XVII, Feb. 1866, pp. 152-166; Mar. 1866, pp. 276-295. A review of the political conflict in America by Alexander Harris (1876). Harris was a Lancaster lawyer and outspoken critic of the war. I recently found that my GG-Grandfather testified on the 8th day of this trial (Dec 17, 1851). Interesting. Was that one of your gg-grandfathers who became an officer in the 79th PA? What role did his testimony play in the trial? Recruiting Update: "Now or never is the time"